Now in its second printing, this engaging book is a perfect gift for for someone who wants to garden vicariously on a winter day while sitting beside a cozy fire. According to The Garden Interior editor David Jensen, “No less an authority that the mighty Cicero opined: ‘If you have a garden and a library, you have everything you need.’ And how true that is, especially if that library contains at least a few really good gardening books. In the past it has been hard to know where to begin, but now it is much easier. Elizabeth Barlow Rogers has produced this volume, subtitled A Literary Conversation across Two Centuries, which has rightly won the prestigious American Horticultural Society Book Award. 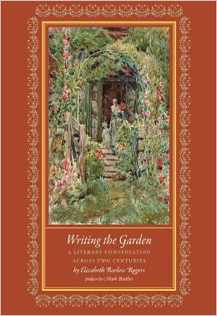 It fluently but never frivolously discusses the garden writing of more than three-dozen great writers, sampling their work and presenting it in a superbly enlightening context. The book is divided into twelve sections beginning with ‘Women in the Garden’ and ‘Warriors in the Garden’ and going on through ten other categories, including ‘Rhapsodists,’ ‘Humorists,’ and ‘Philosophers.’ On the whole this is a balanced and very well curated collection of some of the world’s finest garden writing.” For other books by Betsy Rogers, click here.